Apple's near-term growth prospects look very good, yet Apple stock has sagged since the company's Q3 earnings report. 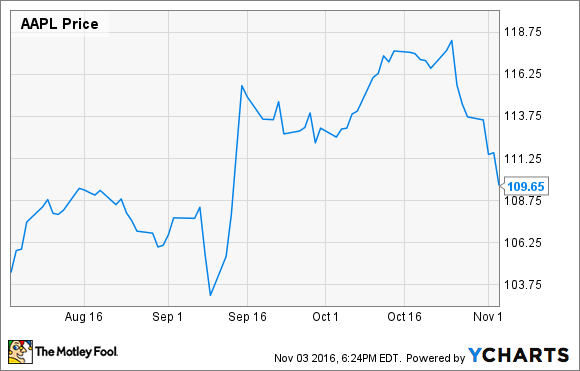 During September and early October, shares of Apple (NASDAQ:AAPL) rallied from around $105 to nearly $120, helped along by every new story detailing Samsung's (NASDAQOTH:SSNLF) Galaxy Note 7 disaster. Apple then reported solid earnings for its fourth fiscal quarter and forecast that revenue would start growing again in Q1. Yet since the earnings report, Apple stock has fallen into a steep dive. On Thursday, it tumbled below $110 for the first time since reports of battery problems with the Samsung Galaxy Note 7 began to circulate in early September. With Apple now firmly on track to return to revenue and earnings growth this year, the recent plunge in its stock price is somewhat baffling. Indeed, Apple stock once again looks very cheap. For the current quarter, Apple expects revenue to reach $76 billion to $78 billion, up from $75.9 billion a year earlier. Revenue growth should accelerate after Q1, as year-over-year comparisons will become much easier. Moreover, Apple's Q1 guidance could prove to be conservative. So far, demand for the iPhone 7 Plus is vastly exceeding supply. Part of that probably reflects people deciding to buy Apple's "phablet" offering after Samsung's Galaxy Note 7 flamed out (literally!). Yet Apple has a long track record of boosting supply to meet strong demand during the holiday season. It's still relatively early in the quarter, but iPhone 7 Plus supply seems to be improving gradually. More Apple Stores have at least some iPhone 7 Plus models in stock, iPhone 7 Plus usage is rising at a steady clip, and the lead time for the popular jet-black version of the iPhone 7 Plus has declined significantly. That bodes well for Apple's revenue and earnings in Q1. Apple is seeing very strong demand for the new iPhone 7 Plus. Image source: Apple. Next year, Apple is expected to unveil a radical redesign of the iPhone in honor of the iPhone's 10th anniversary. That could drive a big upgrade cycle, while bringing in lots of new users, as was the case when the iPhone 6 and iPhone 6 Plus launched two years ago. In that fiscal year, iPhone unit sales jumped 37% year over year, causing Apple stock to surge higher. Apple's recent Mac lineup refresh could also contribute to revenue growth, especially since Apple dramatically raised the prices of several models. Meanwhile, Apple's services business continues to deliver steady growth, primarily driven by rising App Store sales, as well as growth in AppleCare subscriptions, possibly linked to Apple's iPhone Upgrade Program. Is Apple stock a bargain again? After falling below $110 on Thursday, Apple shares trade for about 12 times the company's projected fiscal 2017 earnings. That's a significant discount to the S&P 500 in and of itself. However, Apple also continues to have a huge amount of excess cash. Apple's $150 billion net cash position accounts for a quarter of its market cap. If the U.S. government ever manages to reform corporate taxes, Apple may have an opportunity to repatriate hundreds of billions of dollars of overseas cash at a relatively low tax rate. It could then use this cash for share repurchases or a big special dividend. After adjusting for the value of this excess cash, Apple stock's current valuation is closer to 10 times forward earnings. Furthermore, analysts may be underestimating Apple's earnings power this year. If Apple can steal a meaningful number of customers who would have purchased Samsung's Galaxy Note 7, it could blow past analysts' earnings estimates, because the iPhone 7 Plus is such a profitable product. Apple stock has hit plenty of ruts in the past five years. But each time the stock has sold off, it has bounced back in short order, rewarding investors who went against the herd and bought shares of Apple when the stock was struggling. Apple is poised to return to solid revenue and earnings growth this year, largely thanks to better-than-expected demand for the iPhone 7 Plus. Next year's iPhone 8 product cycle will probably drive even faster growth. With these (and other) opportunities ahead, Apple stock shouldn't be trading at its current rock-bottom valuation. It probably won't stay down for long.